Nathaniel Kirera wasn't expected to survive birth. When he did, then he wasn't expected to live to see his first birthday, much less his 14th. He also wasn't supposed to be able learn, let alone write a book. But he's done all that, and today his medical odyssey is behind him. 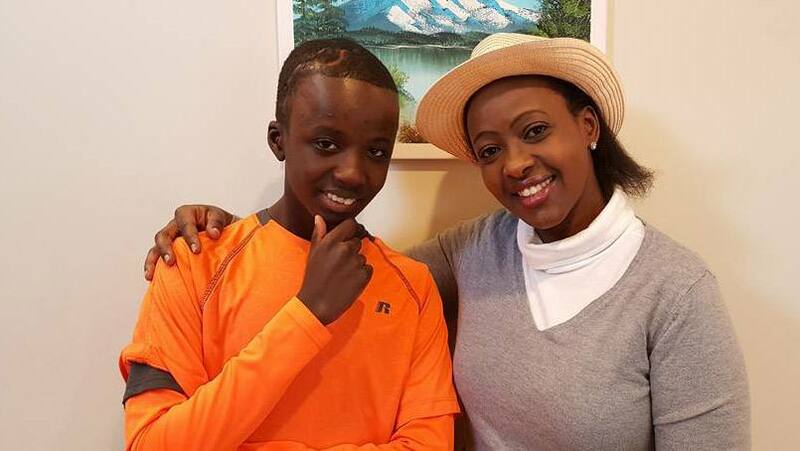 That Nate has achieved so much despite having multicystic hydrocephalus, a condition in which half of his brain and its fluid drainage system formed abnormally, is no surprise to his mother Ann Makena, who, while she was pregnant, dreamed of a son walking and talking. Nate’s successful birth isn’t the only marvel Ann believes has graced her family’s life. Coming to Mayo Clinic’s Rochester campus and meeting pediatric neurologist Katherine Nickels, M.D., in the Division of Child and Adolescent Neurology was another wonder from Ann’s point of view. When Ann and Nate arrived at Mayo Clinic, Nate was 9 years old. The preceding years had been filled with seizures, medications and surgeries. He’d had 14 surgeries before he came to Rochester. Immediately after birth, Nate was outfitted with a shunt system to mitigate the effects of having multiple, fluid-collecting pockets in his brain. The fact that more than one pocket existed meant the shunt required multiple revisions and the insertion of more than one catheter to drain the cerebrospinal fluid. Despite his frequent surgeries, Nate thrived and met all the usual developmental milestones. He attended school and did well until he was six-and-a-half years old. At that point, the malformations of his brain’s grey matter and fluid drainage system caused the tissues to seize. Medications were prescribed to control the seizures. They had little effect. Nate continued to have multiple seizures almost every day. In addition, the medications triggered significant side effects. They caused Nate to become listless and, eventually, he was unable to control his bodily functions. A pediatric neurologist who cared for Nate as an infant had a suggestion. He told Ann that he’d refer Nate to Mayo Clinic’s Department of Neurology. Knowing her son needed something different, she agreed. “He was really in bad place when he came to Mayo,” Ann says. Nate’s Mayo Clinic neurologists approached his problems head on. After meeting with the team of doctors who would be caring for him, Nate had a slate of tests to determine the exact cause of and potential treatments for his seizures. The recommendation for many children who have multicystic hydrocephalus is modified hemispherotomy. This surgery involves disconnecting the abnormal hemisphere of the brain that is having seizures from the normal hemisphere that still functions well. Given that Nate’s doctors couldn’t just disconnect the side of his brain causing the seizures without generating additional problems, they needed to isolate the location of the problematic tissues. That was difficult because Nate’s brain structure did not form normally. Dr. Nickels says she and her team had a good idea of where the seizures originated. But they needed to be certain. To pinpoint the precise spot, pediatric neurosurgeon Nicholas Wetjen, M.D., performed a surgery to place electrodes directly on Nate’s brain. The electrodes allowed the doctors to monitor Nate’s seizure activity and see where it was coming from. Sequestered in his bed in an intensive care unit with video games and books, Nate and his care team waited 16 days for a seizure to occur. When it did, his team charted exactly where the electrical activity originated. “I think this is a wonderful example of different subspecialties working together, but also our ability to incorporate the family as part of the team.” — Katherine Nickels, M.D. With a map of the problematic tissue guiding them, Nate’s neurosurgery team, led by Dr. Wetjen, removed the tissues that were most involved in Nate’s seizures. Dr. Wetjen also operated on the pockets of fluid in Nate’s brain, so the entire system could drain better, and Nate would no longer need repeated shunt modifications. Nate’s surgery was successful at dramatically reducing his seizures. Due to the extent of his abnormal brain structures, however, and because only the areas most involved in seizures could be removed safely, Nate needed additional treatment for the seizures. Because Nate is very sensitive to the side effects of anti-seizure medications, Dr. Nickels recommended he be treated with a ketogenic diet. This high-fat diet, developed by Mayo Clinic about 100 years ago, has proven to be effective at reducing seizures. Fats, when metabolized by the body, produce ketones. These molecules affect the brain’s metabolism and help stabilize the brain’s membranes, making them less likely to seize. Nate spent almost a month in the hospital recovering from his operation and adjusting to his new diet with the help of a dietician. During that time, Ann stayed with Nate in his hospital room. Every day of their stay, she was met with compassion, Ann says. After nine months adhering to the diet and taking two anti-seizure medications, Nate’s seizures disappeared. While he still has regular follow-up appointments at Mayo Clinic to monitor his condition, Nate’s health problems appear to be a thing of the past. Now that the bulk of his medical care is behind him, Nate has written a book about his experience titled Miracles Still Happen: If You Don’t Believe It, Explain Me. His mother has written her own book about her family’s journey, called Knowing and Yielding to the Voice that Counts: Help for Facing Life with Faith and Courage. Ann also has a website where you can learn more about the family’s experience. Read about surgeries to control seizures. Explore Mayo Clinic’s Division of Child and Adolescent Neurology. Check out Mayo Clinic’s Rochester campus. Thank you for the blog. God bless you. It has been a blessed to have Mayo clinic in our family life. It truly is a place of miracles.